In September 2017, Hurricane Maria swept through the Commonwealth of Puerto Rico decimating the island, taking hundreds of lives and demolishing infrastructure on an enormous scale. In the hurricane’s immediate aftermath, Puerto Rico lost 100% of its power usage. The energy infrastructure, which is 98% fossil fuel dependent, was severely damaged to the point that some observers considered repair impractical. 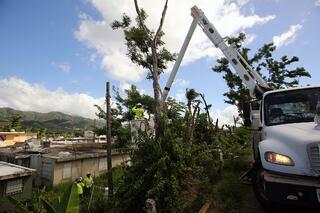 In the first few months after the hurricane, power only had been restored to 70% of the Island’s residents. In addition to the destruction Hurricane Maria imposed on Puerto Rico’s energy infrastructure, the Puerto Rico Electric Power Authority (“PREPA”), the main governmental authority with jurisdiction over energy and infrastructure, exacerbated the problems. With $9 billion of debt, in July 2017, PREPA filed for bankruptcy relief due to the cumulative impact of years of mismanagement, mounting operation and maintenance problems, the failure to recover the costs of providing power to its customers, years’ long battles with creditors, and a diminished workforce. Further, PREPA was unprepared for a major storm of Maria’s magnitude. As Governor Ricardo Rosselló publicly acknowledged, none of the storm response plans could account for years of poor maintenance of a broken-down electric grid. Following the hurricane, PREPA sought outside assistance to repair and improve the Island’s energy infrastructure; however, this effort was unsuccessful. On October 17, 2017, PREPA entered into a $300 million contract with Whitefish Energy to rebuild its power grid. Due to Whitefish’s small size, lack of credentials and some questionable contract terms, investigations were initiated by the House Committee on Natural Resources and the FBI, and, Governor Rosselló canceled the Whitefish contract on October 29. In light of PREPA’s inability to restore power to its customers, in November 2017, the United States Army Corps of Engineers (“USACE”) assumed primary control of the energy recovery efforts. Armed with emergency funding allotments from the U.S. Congress, USACE entered into an $860 million contract with the Louis Berger Group to supply temporary power to residents through the end of September 2018, and an $831 million contract with Fluor Energy to help restore electricity to the Island’s residents via improved energy infrastructure. More recently, in late January 2018, Governor Rosselló announced plans to privatize PREPA. Under the Governor’s proposal, although the Commonwealth would retain ownership of PREPA’s transmission and distribution systems, a private operator would be selected to operate the systems for a period of years. The privatization plan has been met with skepticism, in part based on the past failed attempt to privatize another Puerto Rico utility, the Aqueduct and Sewer Authority. Also, concerns were expressed that the savings promised by private operators may not materialize due to future economic development decisions being left in the hands of those primarily concerned with the return on investment to shareholders. Regardless of whether the Island’s electric utility is privatized, energy infrastructure experts have suggested that the focus shift to developing distributed renewable energy resources to be delivered both on an upgraded power grid and a series of microgrids. A microgrid is a segment of a larger electric grid that can detach and operate on its own to provide localized electricity during, for example, a larger grid shutdown or failure. When operating in tandem with the main grid, a microgrid’s ability to produce energy locally enables customers to draw far less power from the main grid, thereby reducing strain on the main grid. Microgrids also can operate independently, thus offering protection during peak usage hours, primary power outages, or if the main grid becomes unstable. Additionally, wind, solar, biomass, geothermal and small hydro are more practical for use in microgrids because such renewable energy resources typically are decentralized, meaning that generation and transmission occur within a smaller service area. This decentralization lowers costs and reduces carbon emissions. In contrast, conventional power stations that operate on fossil fuel have higher carbon emissions and are centralized, requiring electricity transmission over longer distances at a higher cost. Puerto Rico has endured large-scale destruction, especially to its energy infrastructure. Critical regulatory and policy decisions must be made in the coming months. These decisions will impact the manner in which Puerto Rico redevelops its energy infrastructure and the energy resources that are deployed by the Commonwealth. Regardless of the outcome of the privatization efforts, the development of renewable energy sources and the use of microgrids appear to be a step in the right direction for Puerto Rico’s infrastructure renovation.